You have just installed your new inground swimming pool. Undoubtedly, you are very excited about it. However, swimming pool safety must always be considered. Normally, one associated swimming pool safety with children. But, the likelihood of a dog drowning in a pool is just as high. In addition to overseeing your new inground pool installation, at Mr. Pool, we have also created this list of animal safety tips around a swimming pool. Many people believe that most animals can instinctively swim. This is not necessarily true. Even if your breed of pet is known for their aquatic ability, your particular furry friend might never have been exposed to water and may not be able to swim. In order to ensure they are capable of swimming, gently bring them into the water with you and try holding their back ends up until they start to paddle away on their own. Don’t expect them to get the hang of it straight away. 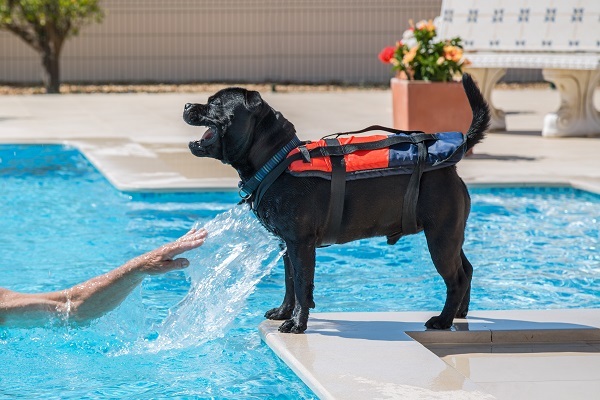 Once your pet can swim on its own, it is essential that they learn how to get in and out of the pool on their own. If they are comfortable in the water, they might swim while you aren’t there. As such, they will need to be able to exit the pool. Whilst it might add to the cost of a new inground swimming pool, pool steps allow your pets to exit very easily. If your animal like swimming they will likely get some water in their mouths. Keep an eye on them drinking out of the pool though. Chlorinated water is not good for them. Splashing around in the water is fun, but it could lead to heatstroke in your pet. Ensure you are familiar with the signs and symptoms of heatstroke in your animal. Also, take care to ensure that the surrounding brick or concrete isn’t hot enough to burn your pet’s paws. If you are looking for a new inground pool, Mr. Pool is the way to go. With 30 years of experience in pool services, Mr. Pool is your go-to for pool repairs, maintenance, and new inground pool installations. At Mr. Pool, we pride ourselves on honesty, trustworthiness, and impeccable service. We have a variety of pool types at your disposal, or you can contact us for more information.